Today, the Minister of Defense Pinotti received the Minister of Peshmerga Sinjari and his delegation, accompanied by the High Representative of the KRG in Italy Mrs. Rezan Kader and composed of the most senior military leaders of the Peshmerga forces. Together with the Minister took part in the interview the Chief of Staff of the Defence Staff, Gen. C.A. Claudio Graziano, the chief of staff of Min. Pinotti, Adm. Sq. Walter Girardelli, the Head of the Office for the Military Policy of the Minister of Defense, Gen. B.A. Stefano Cont, and Min.Pl. Nicoletta Bombardiere, Advisor to the Minister. The Minister Sinjari thanked the Minister Pinotti for the Italian commitment, expressing his appreciation for its role within the international coalition of anti Daesh. He then addressed to the Minister Pinotti a series of demands for better support to the Peshmerga forces in the fight against Daesh, such as military uniforms, gas masks, field hospitals, instruments for demining activities, and availability to treat the injured peshmerga in Italy. Finally, the Minister underlined that the central government does not send the budget by about 16 months and is not collaborating from a humanitarian and military point of view in the fight against Daesh. 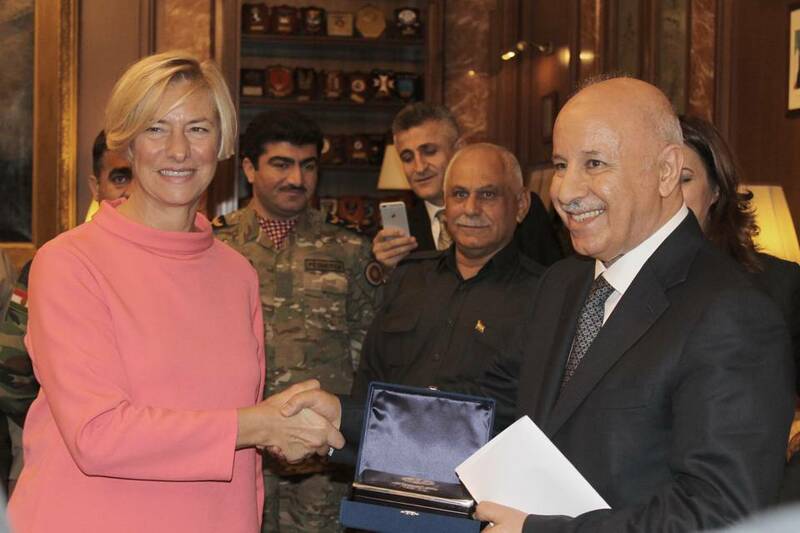 Minister Pinotti expressed his appreciation for the role of Peshmerga in the fight against the terrorists of ISIS and the progress made on the ground, as the liberation of Sinjar. "We will continue to provide, together with other members of the Coalition, activities of training the security forces of Kurdistan," said Minister Pinotti, recalling that Italy, with about 200 soldiers, is the first contributor of the Kurdish Training Coordination Center. Since the early months of 2016 is also expected to send a team of 15 policemen in Erbil to train the Kurdish Regional Police. After the talks, the Minister Pinotti and the Minister Sinjari have given an interview to the Kurdish TV, such as Rudaw and K24Tv.